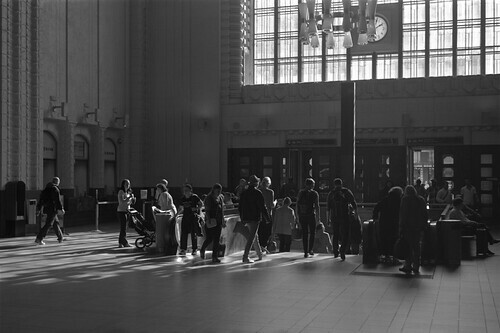 Some Thoughts On Railway Stations, etc. Like Margaret Schlegel referred to in the quote from Howards End, having grown up in the suburbs of London, "the various railway termini" represented similar feelings for me, although rail travel had fallen out of grace during this period. The railway termini that had a hold on my imagination when younger were Liverpool Street and Waterloo, especially Waterloo, as this became the gateway to university life, just at the point that British Rail was broken up and privatised. To add to the "glorious and the unknown" of Waterloo, the Eurostar services began to run from the station in 1994; although our first year degree course trip went to Paris went by coach and ferry, two weeks later the Foundation Course also went to Paris, to the same hotel on the Boulevard du Magenta, by train. Forster specifically defines the stations termini although he generalises "a great capital", which in Howards End is Edwardian London. London's main railway stations are of course all termini, due to factors in the historical development of the city's infrastructure, mainly the size of London itself when the railways were introduced to the city, making it a less than practical endeavour to lay tracks directly through the capital from one side to the other, as well as the factor of the railways being built by competing private companies. This situation is only now being changed by Crossrail. Other capital cities suffered from the same infrastructural complexities, notably Paris, also very large by the middle of the nineteenth century, and, like London, has the same arrangement of terminal stations in a ring around the centre. St Petersburg, as a planned eighteenth century city is the same. 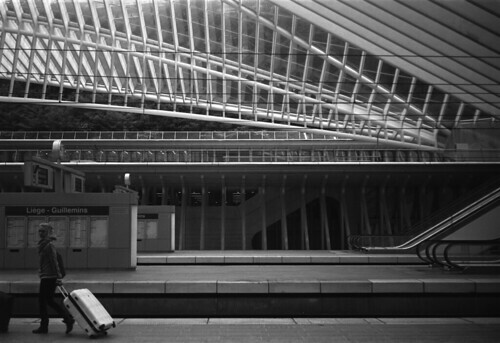 In smaller cities however, some that I have recently travelled through by train, Brussels, Cologne, Hamburg and Copenhagen, the main railways stations are of the type where the trains run straight through: the terminal station has an implication that the capital or other city is a natural destination rather than just a stop (other than old capital cities, terminal stations are most frequently found on the coast). This may, in some small measure, account for one aspect of the capital-centric economy of the United Kingdom. Rail travel was one of the nineteenth century technologies that fractured space, along with advances in image reproduction, identified by Patrick Keiller in his relating Henri Lefebvre's ideas to early cinema, and quoted in my post The Phantom Ride. The great railway stations in Europe were designed with the necessity of steam, with the result that the high spans of the train shed roofs often brought comparisons to cathedrals. 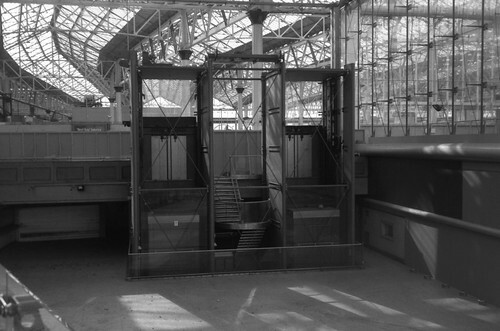 As a result, these stations were not built with an economy of space, which has meant for contemporary use these generous spaces can be re-purposed, and frequently filled with kiosks and shops, often on more than one level, maximising the footprint of the buildings. When no longer a necessity, these railway termini are also beautifully adaptable, being re-used for cultural purposes such as the Musee d’Orsay in Paris and the Hamburger Bahnhof in Berlin. The former cathedrals of the nineteenth century's new connectivity have become cathedrals of culture. Recent attitudes towards station architecture show a new or, perhaps more accurately, a renewed pride: from the low point of the rebuilt Euston Station, designed to be like an airport for the period when air travel being glamorously within reach of larger parts of the population, hiding the messy business of the trains themselves, to Berlin's new Hauptbahnhof and the renovated Kings Cross and St Pancras in London as just two recent examples. It is a truism to ascribe large, general similarities to airports around the world, a feature of post-war modernity, "subordinate pseudo-places" in Paul Fussell's words (tourist destinations are "pseudo-places" par excellence). 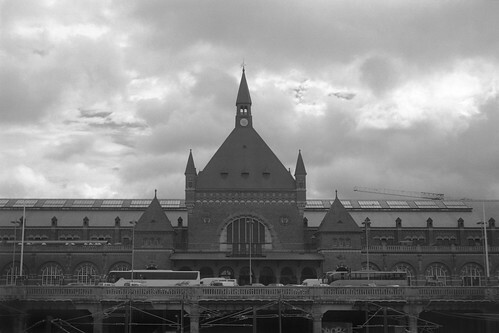 By contrast, many large railway stations’ architecture is very particular, even vernacular, often from imperial periods in modern nation states' development, with stylistic reflections: Cologne’s steel arch with its glazed soaring lunettes either end (with neon names of brands associated with the city), Helsinki's distinct Baltic Style Moderne, Copenhagen’s double-vaulted wooden beamed roof, suggestive of an oversized medieval lodge. 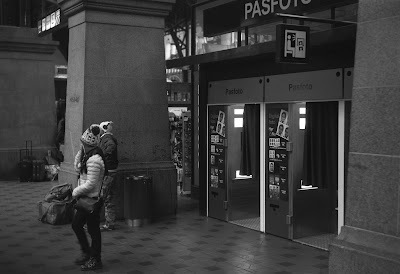 The Bocca Della Verita in Copenhagen Central that I had photographed in 2008 has gone from its position by the photo booths. 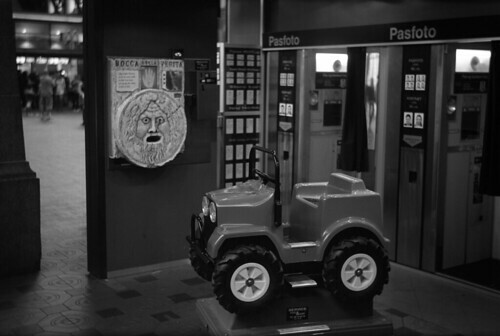 I photographed the original in Rome four years earlier, the replica of it in Copenhagen was a fortune-telling machine for travellers to consult, oracle-like, before a journey.